What do you do when it is 107 degrees outside this window? When the only thing flourishing is the banana trees that you don't really like but they make a great sun block. When you don't feel like cooking because who wants to stand in front of the stove. When reading about the pathology of disease has turned you into a loony hypochondriac. Make two salads. One cucumber, tomato and bell pepper. Then make a fruit salad. Honeydew, strawberries, nectarines and plums. Add a 1/4 cup of Captain Meyer's Spiced Rum to the fruit salad and the sweetener of your choice. I used Splenda. Eat cold salads. Feel much better. Last night instead of whining about our trip to McDonalds, I should have been checking the mail. I could have shown you these sweet bookmarks Angela at MissMollyCottage made me for ShabbyintheCity's bookmark swap. Aren't they cute? I love both of them and I will have to find somewhere to display them year round. 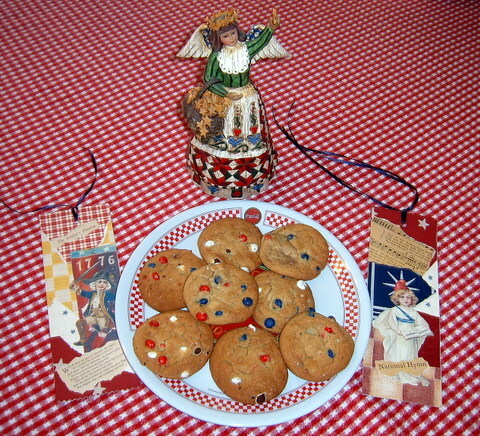 Maybe with my Jim Shore angel but certainly not with my 4th of July cookies. The cookies were a surprise from the neighbor. Now, I am off to my brother's barbecue with my watermelon, corn and cookies. Sounds good!